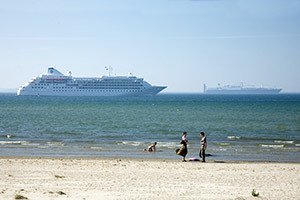 Tallinn is very easy to reach – the airport is located 2 km from the city. The harbour, bus station and train station are all located in the city centre. By Air – the largest international airport in Estonia is located in Tallinn (TLL). 13 different airlines fly here and Helsinki-Vantaa (Finland) airport is only 100km away. Drive To Estonia – driving to Estonia is very simple and convenient. For competitors arriving from Finland and Sweden by boat, Tallink is offering boat tickets with a 30% discount from the regular price. All competitors receive the discount code via email with the WMOC registration confirmation. Transport to the long distance model event, long distance qualifications and final will be organised with buses from the event centre directly. The bus ticket price for 4 days (long distance model, two qualifications and a final race) is €40. The sprint model event and sprint competitions can be reached by Tallinn public transport. Travelling by own transport – a fee will be charged for parking at the long distance event centres. Parking fee includes shuttle-bus transport from parking area to competition centres and back. Coming with own transport, participants need to consider extra time for parking and shuttle-bus transport to reach competition centre. Hertz – the official car rental partner of WMOC 2016. Enjoy the benefit of special discounts for the orienteering world. Public transport is free of charge in Tallinn Transport area ( not including Regional Transport area) for WMOC and TOW competitors starting from 5.08.2016 until 14.08.2016. Remember to take your number bib with you, that’s for the ticket. Without your number it is required to buy ticket from bus driver. Organisers advise to use public transportation. The competition areas ( Freedom square and Kadrioru Park) and also Event Center is in Tallinn Transport area and public transport is usually faster, especially in rush hours. Travel by the Tallinn public transport system is also free when buying Tallinn Card. Tallinn Card is an all-inclusive city card offering the most convenient way to get acquainted with the entire town. Accepted in nearly 80 locations, it entitles free admission to 40 top city attractions, free public transport, a free sightseeing tour of your choice and various other offers or discounts. If you take a taxi you are advised to ask the driver for the approximate price before departing. The taxi can be either hailed on the street or called in front of the hotel/pub. Driving around the city is usually 5 Eur. The best way to order taxi is to use mobile app – Taxify. Taxify is a free smartphone app which seamlessly connects people to hundreds of taxis at the push of a button. No more call-centres or waiting on the street. It is simple, fast and affordable.